24 hr. Bicycle Marathon was held on May 27 & 28 @ Athletic Field. Class of 1950 weekend "Giving back" reunion May 12-14, starts at HHHS Fri. 7:30 p.m.[Story] [Photos] 13 scholarships were awarded. 1/2 hr video made by Class of 2000 interviewing Class of 1950. Special issue of Pilot's Log printed. Also 4 pages are in Class of 2000 Yearbook. Picnic @ Woodland Park Sat. Reunion @ Feista Sat. Nite. [Record] story. 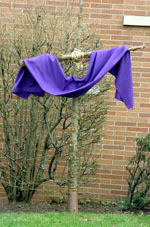 Bible Baptist Passion Play opened on March 30 @ Felician College Theatre in Lodi. HH Touchdown Club Golf Outing, Aug. 24 @ Knoll West CC (Parsippany). Shotgun start 1:30 p.m. Lunch, dinner, raffle & prizes. $130. Hole Sponsoship $50. Call Rich @ 288-2921. Children are dressed in patriotic costumes, ride decorated bikes and present creative floats. Every Tuesday this summer @ 2 p.m. (starting June 20), the HH Chamber sponsored Farmer's Market will be located at the corner of The Boulevard & Washington Place. Holy Trinity Lutheran Church has scheduled its annual ecumenical Vacation Bible School from June 26 to June 30. Annual Picnic & Awards Ceremony Saturdays June 24 @ LL. Field 11:00 a.m. to 3:00 p.m. Events include games & skill competition. Refreshments. Open to all children & siblings who participated in the 2000 Little League or Babe Ruth Seasons. Annual Door-to-Door Fundraiser. Envelope drop off Sat., June 17. Pick up Sat. Jun 24 (before picnic). Call Greg Condal for details. 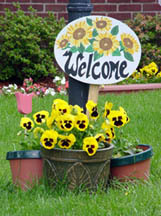 Chamber sidewalk sale was held June 1,2 & 3.. The Library Book & Bake Sale was held June 3. Senior Soiree was held Saturday May 20 @ HHHS cafeteria. Sponsored by Key Club. [HHPD] offered a Scholarship to a graduate from HHHS interested in a career criminal justice. Education Foundation held a talent show May 5 @ Kiefer Auditorium. Hasbrouck Heights Men's Association held their Fifth Annual Beefsteak Dinner Dance, Friday May 5th. Dancing , dinner, Round The Dial D J, Door prizes and featured appearance by Uncle Floyd. Easter Bunny scheduled to visit. Event was rained out. Annual dog licenses available now. Due to fire, owners must provide all info, including valid rabies vaccination (10 months). $7 altered. $10 not altered. Health Dept. at 218-222 Boulevard. Anthony Miele received Jubilee Medal ProMeritis for his distinguished service within the Newark Archdiocese on April 30 @ the Cathedral Basilica of the Sacred Heart. "Longest continuous sitting Municipal Judge in New Jersey"
Bible Baptist Passion Play was held Mar. 30, April 1, 2, 7, 8 & 9. Fri- Sat - 7 p.m., Sun - 4 p.m.
@ Felician College Theatre in Lodi. 11th year. Admission was free. Signed for deaf. 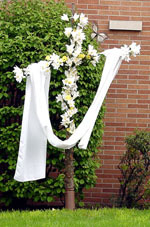 on Palm Sunday, Apr. 16 @ 3 p.m. & Wed. Apr. 19 @ 7:30 p.m.